Classes & Courses Conversational language courses. Knowing Mandarin is an added advantage for those who are in the hospitality or service industries and those who go regularly on business trips or vacation in countries where it is used extensively. This course covers basic pronunciation, listening and conversational skills in just 3 months. There is also an Intermediate Level course. While at work, you will often come into contact with people speaking different Chinese dialects. Knowing their dialect will make it easier to communicate with them. Why not learn Penang Hokkien especially if you are going to be in Penang for the next few years and/or working with the local Chinese. Thailand, our neighbour, is where you go for a short and economical vacation. Imagine how much more enjoyable the vacation will be if you could converse with the locals in their native language. At Penang YMCA, we offer you a basic Thai course which covers simple pronunciation and conversation. The hearing impaired (HI) communicates with one another by using hand gestures. It is a visual-gestures system that makes use of hand gestures to express themselves effectively and expressively. Learning sign language will enable us to share our ideas and thoughts with them. This course is specifically designed for individuals who have no previous knowledge of signing. Afraid of being attacked, robbed or even killed... ... when you are alone? Is it really safe when we are in our homes? It helps if you learn the various defence techniques, disciplines and mental alertness of self-defence. Our Karate Class offers you just that. Let’s get those feet on the floor and moving to the rhythm of music. Join us now and experience the excitement in line dancing. It is a good workout to stay healthy and to improve our physical co-ordination. We hope that you will make the time and effort to come and be empowered. 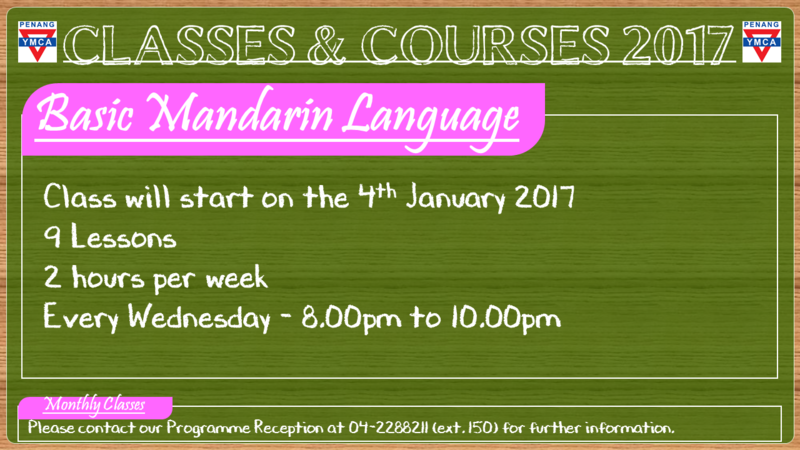 Basic Mandarin Class will start on the 4th January 2017. Class in on every Wednesday, from 8.00pm to 10.00pm for total of 9 lesson. Basic Hokkien Class will start on the 16th January 2017. Class in on every Monday, from 8.00pm to 9.30pm for total of 12 lesson. Basic Italian Class will start on the 21st July 2016. Class in on every Thursday, from 8.00pm to 10.00pm for total of 9 lesson. Basic French Class will start on the 23rd Feb 2016. Class in on every tuesday, from 8.00pm to 10.00pm for total of 9 lesson. French class teacher is from France and is a lecturer from Segi College penang. Basic Japanese Class will start on the 7th April 2016. Class in on every Monday, from 8.00pm to 10.00pm for total of 9 lesson. The Japanese class teacher is from Japan. Basic Mandarin Class will start on the 23rd March 2016.